It's one of the most easy and fast communication tools. Twitter allows you to share information, images and videos. With Twitter you can be in constant contact with your friends and family, and allows you to meet many new people. Without a doubt, this list can help you to get the most of Twitter. 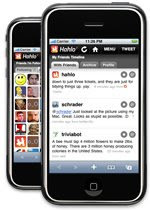 Hahlo, Twitter client for iPhone and iPod. It has a lot of features and a very neat and appealing interface. Yahoo Messenger Twitter Plugin, Integrate Yahoo Instant Messenger with Twitter so you can post to Twitter from it. Spaz, Desktop client for Linux, Mac and Windows. It is opensource, fully customizable and has a very appealing design. TwitterFone, Post messages to Twitter using your voice through your mobile phone. 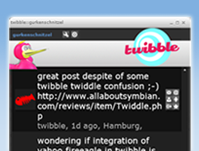 Twibble, Client software for Windows and Mac. Full of interesting features. 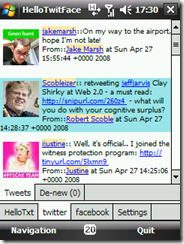 HelloTwitFace, Twitter client software for Windows Mobile. Twit From Terminal, This is a geeky trick to post to Twitter from Terminal, which Linux users would love. 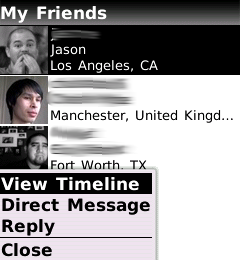 TwitBerry, Twitter client application that runs on a BlackBerry. 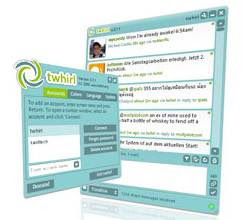 Twhirl, Desktop application that can connect to multiple Twitter accounts that you have, and to Friendfeed at the same time. It can also send messages to Pownce and Jaiku. Twitteresce, Java Twitter client for mobile phones. 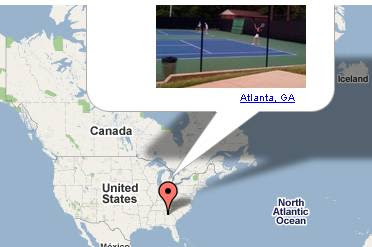 TwitPic, Web tool that lets you share images on Twitter and also watch in real time what images people share. TweetCube, Share and send files through Twitter. Share as many files as you want, of a size of 10 MB or less. Twit+, Service to share videos, images and files through Twitter. Twixxer, Solution that consist in installing a Firefox plugin (Greasemonkey) and a script, and after that you can share and view pics and videos directly on Twitter. 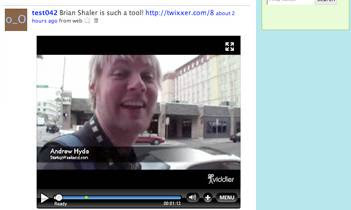 Twiddeo, Share videos on Twitter using this service, and also watch the recently shared ones in their website. This gives it the added value of promoting your videos. TwitterCritic, If you like Twitter and movies, this web tool tells you the opinions of Twitter users that have been posted, so you can decide to watch some movies or not. Bkkeepr, If you like reading and Twitter, this is a way to share your readings through Twitter. TweetWheel, You enter the Twitter name of someone and it makes a wheel graphic with his/her contacts. This also shows the connections between them, who's friend of who, etc. Twellow, Index of people in Twitter in categories. You can also add yourself to this index. Twits Like Me, Find people that are similar to you to add them as friends in Twitter. Twubble, Lists people that you may like to follow, as they share common friends that you are already following. Twist, Like Google Trends but in Twitter. Compare the use of words inside Twitter. 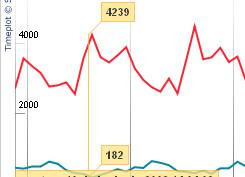 You enter two words and it shows a graph with the compared amount of use they have. Twitio.us, Like a del.icio.us of twits. You can install a button in your browser that will allow you to send the url you're watching directly through your Twitter account. There's also a website with the last twits sent, and the most popular ones. Twitturly, It's like a Digg of Twitter. All the most shared urls of Twitter are published here. 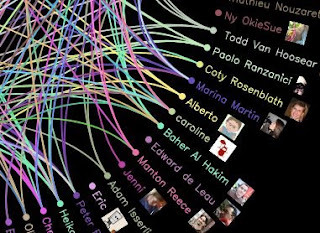 Tweetlists, This website shows the people with more Twitter followers, the most linked domains, and the most popular links on Twitter. Tweetgift, Give small virtual gifts to your Twitter friends. Free Twitter Graphics, Very original buttons in PNG and GIF for making easier to your visitors to follow you on Twitter. TwitterFeed, This tool posts your RSS to your Twitter every time you publish a new post on your blog. It can be used to post any RSS Feed to Twitter, not only blog posts, so your updates, or RSS of social sites, can be automatically published on your Twitter. AutoPostr, This web service post a message automatically to Twitter when you add a photo to Flickr. TweetLater, Schedule your twits for later, to be published when you want. TwitThis, Button that you can insert in your website or blog and make easier for visitors to send your page or posts to Twitter. Tweetburner, Creates a short url that you can post to Twitter, and in addition you can keep track of it and see if it is shared and clicked. Twiddict, Sometimes Twitter is down. 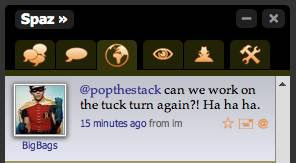 When it happens, you can post to Twiddict and they'll post your messages to Twitter when it's up again. Post Like A Pirate, You can write something and this web tool instantly converts it to pirate slang and sends it to twitter. A fun tool to talk like a pirate. LOL!!! Quotably, To follow conversations in Twitter is difficult, and to reply them too. This web tool makes it very easy as it shows conversations threaded. TweetBeep, Alerts you when someone mentions something that you want to watch, and emails you. Tweet2Tweet, Shows conversations or replies between 2 Twitter users that you specify. Another possible use is to know if someone made references to you or replied and you didn't noticed. TwitterIgnore, Ignore the messages of a too talkative Twitter user without actually unfollowing him/her. Crowdstatus, Another way of seeing a group of people's twits. It shows the messages of the selected people in a single page, so you can visualize them as a whole, being less confusing. TweetDumpr, Exports your messages on Twitter and the time the were sent to a file that emails to you. TwitRefresh, For lazy ones, it loads your Twitter page and refreshes it every minute. TwittEarth, Watch messages of the Public timeline of Twitter in real time over a 3D Earth and watch cool monsters as avatars. Twistori, Fun experiment that consists in a scrolling text of the messages that people send containing the words love, hate, think, feel, believe... An inspiring one. Twittter Spy, Watch the Twitter public conversations as they come, read them, pause or play the upcoming of messages, and locate them in a map. 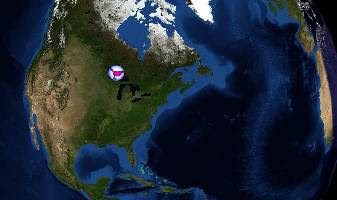 TwitterVision3D, Shows a rotating 3D Earth globe with the blurbs of messages of people in real time. 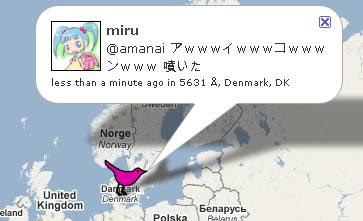 TwitterVision, This tool shows a map of the world and shows in real time the messages of people in blurbs as they come to Twitter. PollDaddy Twitter Polls, Use Twitter to run polls using the free PollDaddy service. Chirrup, Use Twitter as a comment system for your website, wiki or blog. HelpWith, Get help and help others asking and answering questions with Twitter and this service. StrawPoll, Run polls on Twitter and ask whatever you want through it. Tiwtzu, Web tool that finds an use for Twitter as a way to organize events and post them to your followers, that can sign up and tell you that they'll come. TwitterDoodle, Wordpress plugin that shows the messages of people in Twitter that mention a topic of your choice. So you can place it in the sidebar and have related content through Twitter. 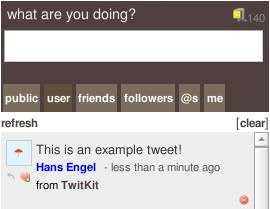 TweetScan, Search engine that looks into the messages of people in Twitter and gives you a list of the ones in which your search was mentioned. Summize, Searches on conversations of Twitter in real time. A faster and powerful search engine, with docs for programmers that want to make some application based on it. TwitterFox, Firefox Extensions that installs a Twitter icon in the status bar. 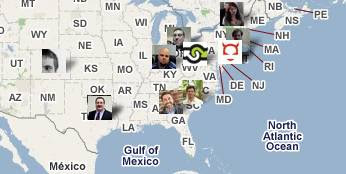 When you click on it, it opens a mini-window that shows the messages of your Twitter network of friends. That way you can keep track of your friends messages while you use Firefox browsing, and don¡t miss anything. TwitterBar, Send messages to Twitter from your Firefox address bar. You can also send the url in which you're in. Twitkit, Firefox add-on that runs in a sidebar of your browser and can deal with most of the possible things that you can do when posting with Twitter. 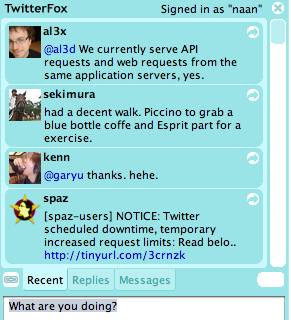 TwitBin, Opens your Twitter page in a sidebar of Firefox, so you can see your Twitter friend's messages while browsing, and reply. If you don't have a wide monitor screen, you may prefer TwitterFox. Tweetbar, Similar to TwitBin. A browser extension that shows your Twitter page in the sidebar, and runs both in Firefox and Flock. A lot of good tools. It's unfortunate that Twitter is having so many problems lately though. Seems like it is frequently losing twits, is very slow and sometimes just shuts down. They seem to have figured out some of the problems, but not all. Thanks for the Twitterdoodle mention. One small clarification - Twitterdoodle creates actual posts based on keyword searches. You can have the auto-created posts go to your front page as any normal blog post or go directly to one of your categories. 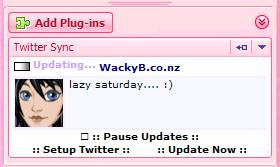 Visit my blog www.lessnau.com to see the plugin in use. Lately I've read some articles saying good things about the usefulness of Twitter. But I'm a guy who likes to mind his own business and maybe this tool isn't for me. I mean, if it got more visitors to my site, heck, I'm a twitter right away. Of course that for other users it will have its qualities, as for me I haven't decided yet. Do you know http://www.twitterpark.com ? Lots of interesting Twittering sites. Thanks for the links!